If you find that the appeal of Counter-Strike: Global Offensive stems more from its aesthetic than its gameplay, then you might enjoy a fan-made video that reimagines Valve’s first-person shooter as a 2D fighting game. Sadly, CS:GO Fighter isn’t eligible for our list of the best FPS games. 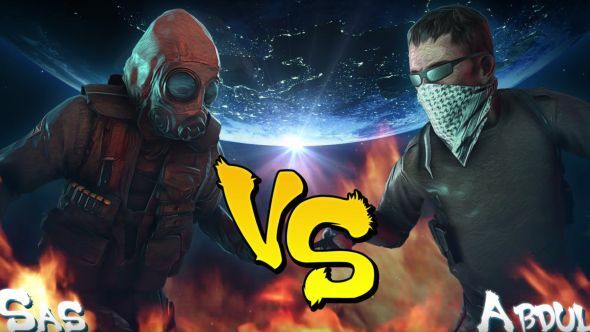 CS:GO Fighter Alpha takes the tropes of popular fighting games like Tekken and Street Fighter, but reworks them into a side-scrolling brawl on Counter-Strike’s iconic Dust map. After selecting their characters (terrorists vs counter-terrorists, obviously), weapons, and stage, the fight begins. Egged on by their teammates, the two characters juke it out in a video that covers a lot of in-game mechanics. Knives, rifles, and flashbangs all feature, and the the bomb even plays a part in the round’s explosive climax. I won’t spoil the ending, but you can check the entire video out above. It might not be the most faithful recreation of the game, since it opts for quite a bit of artistic license, but it’s pretty slick for a fan project, and definitely worth two minutes of your time. If it still doesn’t take your fancy, however, why not check out this CS:GO mod that turns the game into a 2D fighter with chickens instead of men.